IOGEAR new MiniView Extreme Multimedia KVM and Peripheral Sharing Switch brings extra value to conventional KVM switches by offering USB peripheral sharing capabilities, audio and microphone support, and multi-platform support for Windows, Mac, and Sun systems using either USB and PS/2(additional cables needed for PS/2, IOGEAR Part No. G2L5302P). You can save money and space by eliminating the need for multiple monitors, keyboards, mice, and peripheral devices such as printers, scanners, zip drives, and more. Up to 127 different USB devices can be daisy chained from this KVMP switch. Sharing speakers and a microphone also offers extra value and convenience for the users. 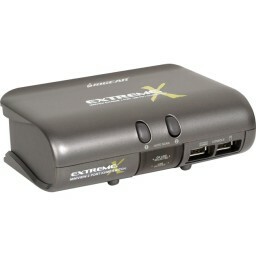 USB and KVM technology together makes cross-platform management easy. A single USB console can control a PC and a Mac, or even a Sun workstation, and share peripherals and audio devices between the computers. Any USB-enabled computers, using any USB-compatible operating system, can benefit from the efficiency, expense reduction and convenience of IOGEAR Miniview Extreme KVMP switch.